Reducing the downtime of machinery is essential to maximise efficiency and production in your plant. Yet routine or emergency maintenance still significantly affecting loss of production. For large installations and where maintenance dictates, CEMB Hofmann UK offers an on-site dynamic balancing service from experienced engineers using our own portable balancing equipment. 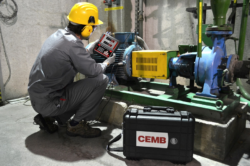 These portable devices can quickly calculate the unbalance value and phase angle in one or two planes, reducing downtime. Misalignment and bearing failure are two causes of vibration. By scanning the vibration, we can identify the origin and recommend the best corrective action. Data logging combined with our own data management software enables us to monitor vibration levels and predict planned maintenance schedules for your plant and machinery.